Unfortunately since the time of writing this article, WOSS has taken an unfortunate turn regarding suspension straps. It seems that they have infringed on some patent rights owned by TRX Training which is too bad. Their products were good and I think that based on the pricing and quality of their products they may have been taking some of the market from the big brand. I am a fan of the WOSS Attack straps and own this set so I am disappointed to see that WOSS will not be manufacturing their straps anytime soon. There are other alternatives available at good prices that you can get. Take a look at our top 10 suspension trainers here. The Lifeline Jungle Gym XT and QonQuill Resistance Trainers are excellent straps for much less than the TRX trainers. If you are starting out with suspension training and looking online for a suspension training straps, you are either looking for a great deal or looking for a great product. In this article I am going to discuss 2 suspension straps and do a little comparison so that hopefully it helps you decide on which set you would like to purchase. 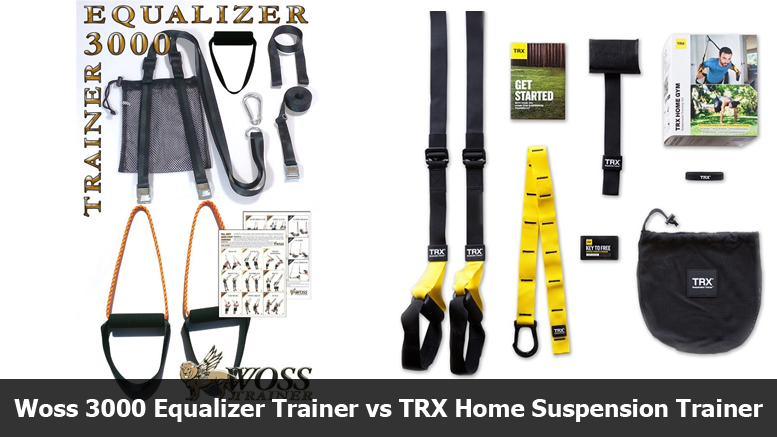 The Woss 3000 Equalizer Trainer and the TRX Home Suspension Trainer are both on my top 5 suspension training straps list and both are high quality products. Albeit with quite a huge price differential between the 2. The Woss Suspension Trainer costs $39.99 and the TRX Home Suspension Trainer costs $199.95. Judging by the price alone, the Woss offers you a much better deal right off the bat. We will look into this further a little later. Woss offers this set in a variety of colors like black, brown, camo, gray, olive drab, pink, purple, red and royal blue. It is a high quality product made in the USA. 2 Adjustable cam buckles on the center strap to quickly and easily adjust the height / length. Anywhere-Anchor Cam Buckle Strap with built-in Door Anchor and one Double Loop Strap – ideal for bars and rafters. Drawstring bag to store your workout system. 18 Full body quick start exercises to get started with your suspension straps. The WOSS Attack Bands come in a variety of colors such as black, gunmetal gray, brown, pink, hot orange (see image), neon green and olive drab. High quality product made in the USA using first grade military webbing. The WOSS Titan bands – Premium Trainer Made in USA with full adjustability and limitless ways to anchor your system indoors or outdoors. These suspension trainers are available in a variety of color such as black, gunmetal gray, brown, olive drab, neon green (see image), hot orange and pink. The WOSS Military bands is the entry level suspension straps and the cheapest from this brand and made in the USA. These trainers are available in black, brown (see image) and gunmetal gray. This Trainer comes with two adjustable cam buckles to easily adjust the height of the workout. You also receive a drawstring bag to store your workout system after your workout. TRX has become a world reknown brand that offers high quality suspension trainers, accessories and apparel. They offer TRX education for personal trainers and exercise demonstrations for your to use with your TRX Straps. Their customer service is very good and you will have a great experience every time. TRX Home Suspension Trainer Kit. Suspension anchor that you can use anywhere. The TRX App with 4 full body workouts. These 2 sets of suspension trainers are pretty similar in what you get when buying them. They both are well constructed, come with the same accessories that you can set up in a matter of minutes and a quick start guide to get the hang of the suspension exercises and how it works. The TRX however has the App and 6 workouts that are 15 minutes long. However the biggest factor is the price and at $40.00, the Woss seems the logical choice and will save you about $150.00. They are both suspension trainers so you will get the same results using either one of them. They both can be used at home on a door and can be taken with you outside or when you travel. If you like branding, then TRX is for you. They are a very good company with an excellent product and customer service. They offer ongoing workouts and exercises that you can add to the 6 that you receive with your order. They offer more for the product than what Woss does. Woss 3000 Equalizer Suspension Trainer is very good value for money and is a great alternative at $40.00. You can get the Woss 3000 Straps and Dan Long’s Suspension Revolution workout program for less than $80.00 (Suspension Revolution is currently on sale for $23.50) which is still $100.00 less than the TRX. With Suspension Revolution, you will have the perfect suspension workouts to compliment your Woss Equalizer Trainer. Dan is always updating and adding new workouts which in my opinion, far superior than those at TRXtraining. The Woss 3000 Equalizer Suspension Trainer is the better bang for your buck and if you are on a budget and want to start this form of training, then this is for you. 1 Comment on "Woss vs TRX Suspension Trainer"
Thanks Rob for this article. Good information on all the suspension trainers that you cover. Got the TRX Force for my boyfriend and the WOSS Attack in pink for me. Looking for forward to getting stuck into the Suspension Revolution program as soon as we receive our straps.